The red-necked avocets are searching for food along the shoreline of the little lake. 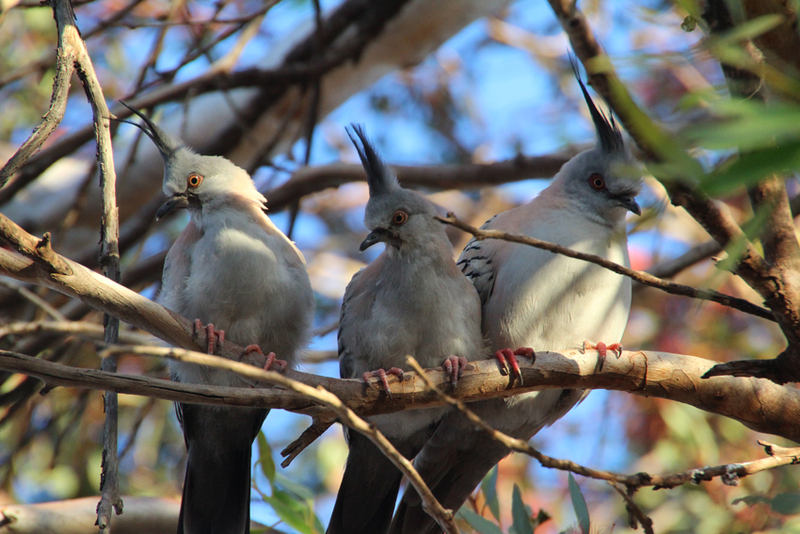 They use their characteristically upwards curved beak to probe for tiny crustaceans and other aquatic invertebrates. 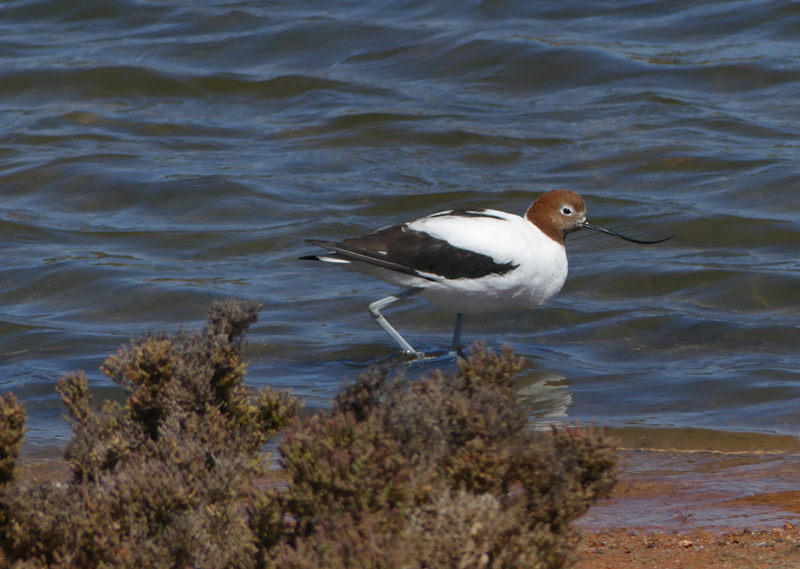 Avocets employ two different feeding strategies. Where the water is clear the birds pick their prey from the surface but in muddy areas they sweep their bills across the sediment flushing out tiny animals to feed on. 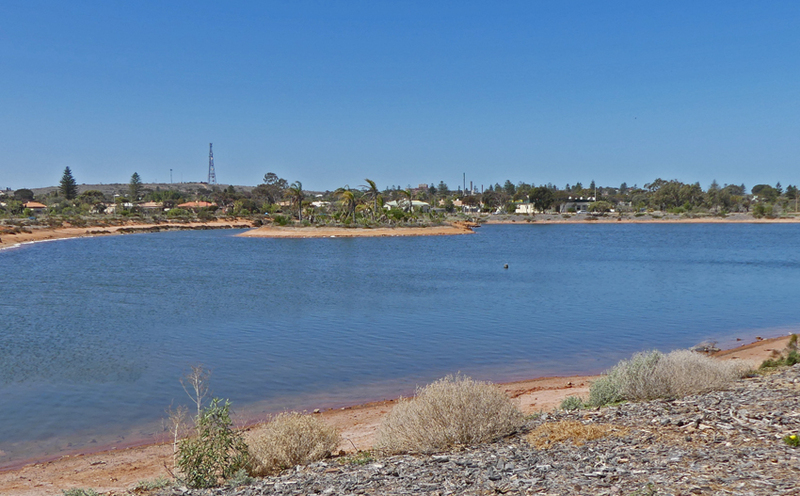 I am walking around the freshwater lake that is the centrepiece of Whyalla’s newly created wetlands. The area has been carefully developed over the last few years with the aid of local community groups. 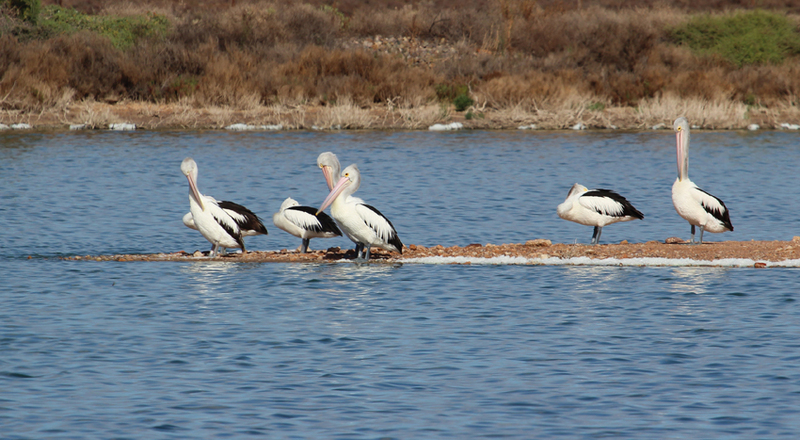 There are significant stands of reeds, grasses and shrubs throughout the park providing a habitat for a range of wading birds including: stilts, ibises, plovers, dotterels as well as larger species such as pelicans and cormorants. 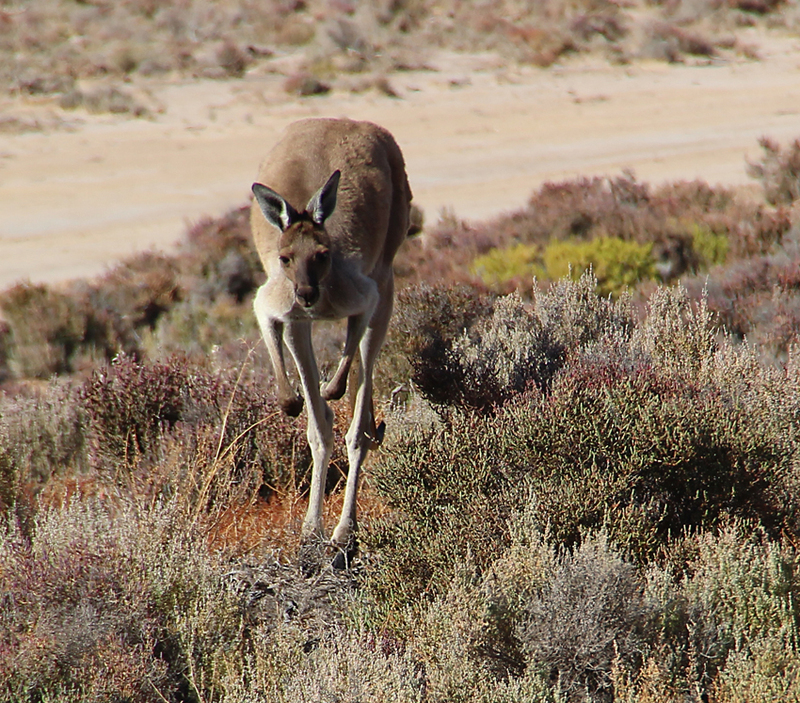 Barbecues, a playground, benches, toilets and sheltered areas make this both an ideal family destination and wildlife oasis in the dry desert countryside that surrounds Whyalla. Further along the trail clumps of native grasses and flax lilies provide shelter and food for quite different kinds of wildlife. 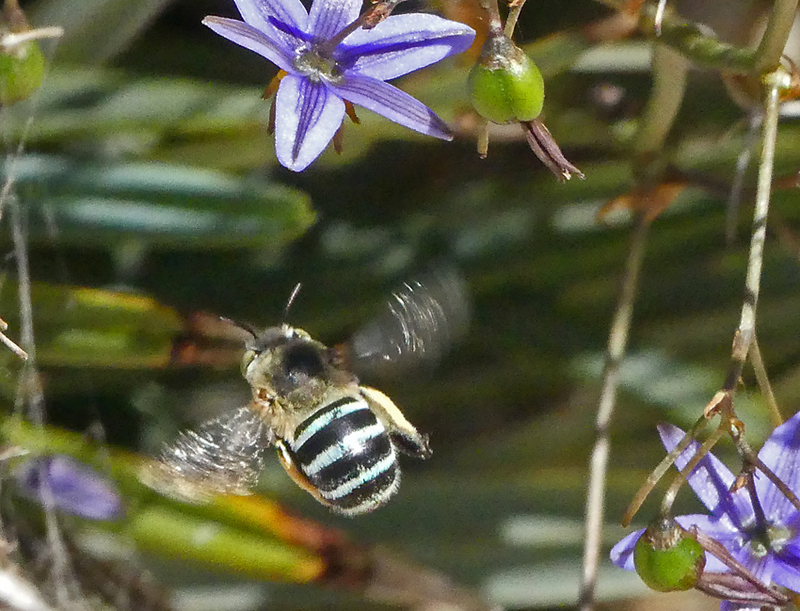 Native blue bees flit between the blossoms where their vibrating wings shake loose pollen. 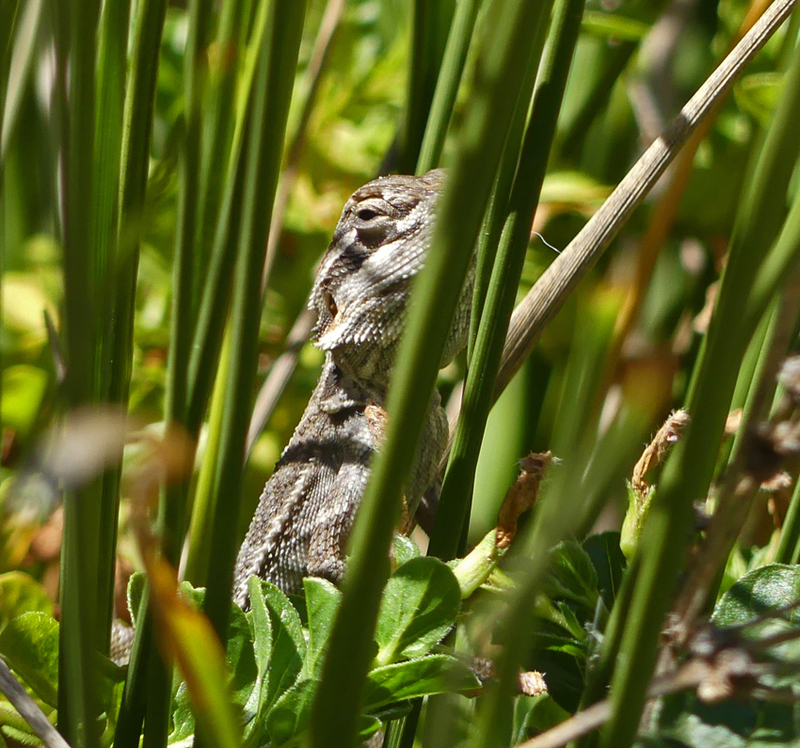 Hidden strategically in the grass blades, a well camouflaged dragon lizard waits patiently for any unwary bee or other insect to venture within its kill zone. The extensive grassed areas provide yet another habitat for those animals that prefer to feed or congregate in open spaces. 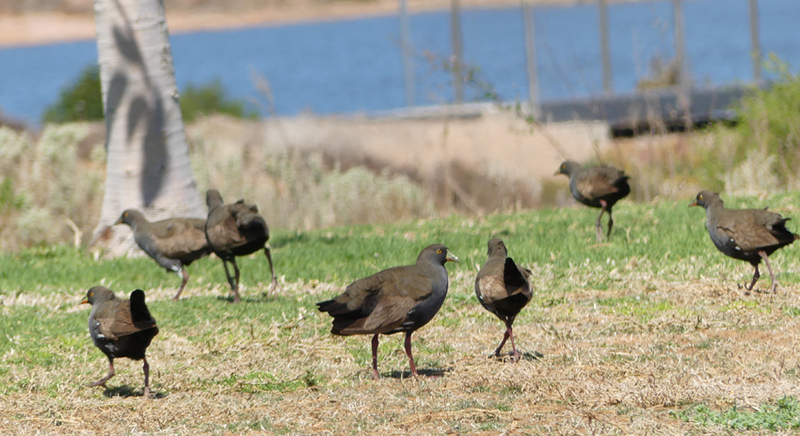 Parrots, ibises and ducks often relish these open areas but today it is a flock of black-tailed native hens that are foraging on the grass. 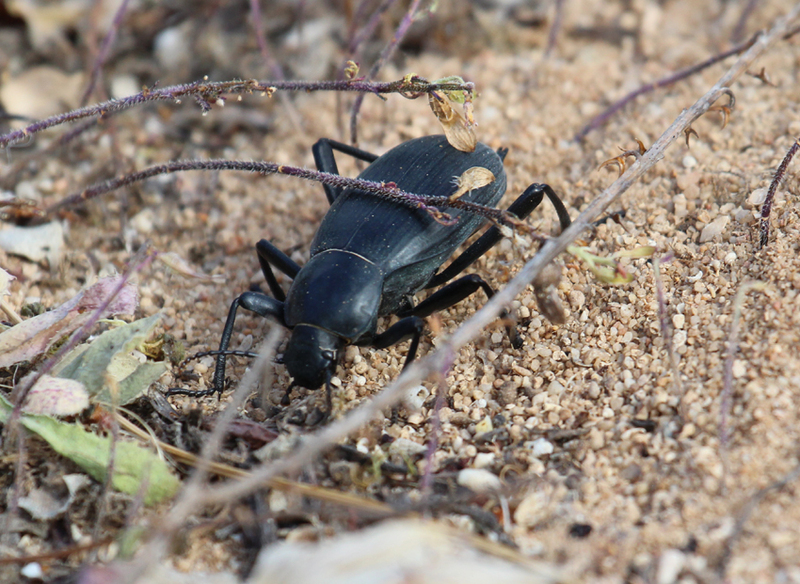 They are nervous and hard to approach and getting a reasonable shot takes a little patience. As my walk draws to a close I notice two delicate little waders close to each other as they feed along the shoreline. 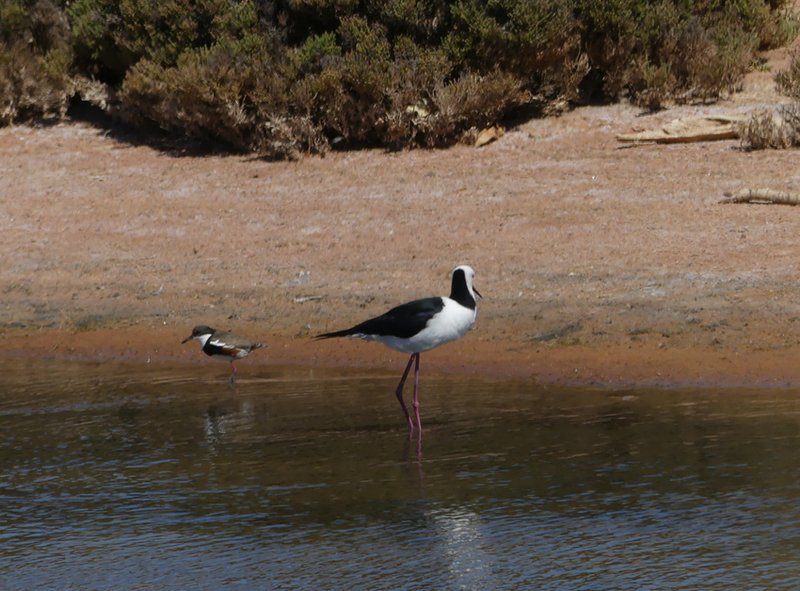 A black-winged stilt with its needle-like beak and a smaller red-kneed dotterel are both feeding in the same area but their different beak shapes means that they are not in competition. 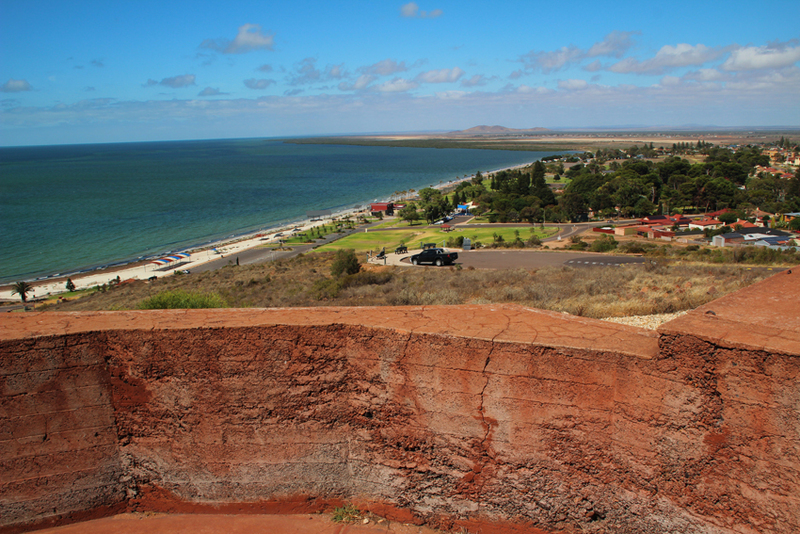 The wetlands are just off the Lincoln Highway at the southern end of Whyalla. 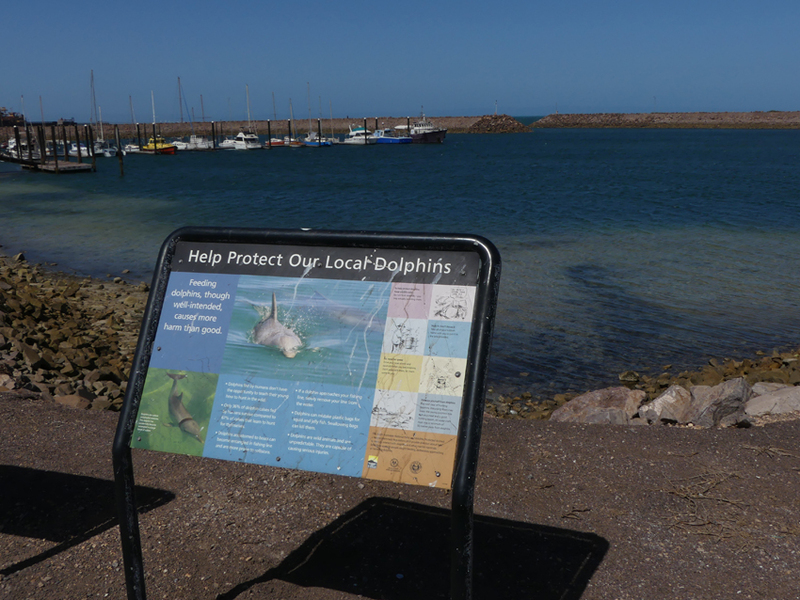 From there it is a short drive into the town or down to the marina which is famous for the pods of dolphins that come up to the walkways to help themselves to any fish discarded by anglers returning to the marina……or perhaps just to enjoy the company of another intelligent species. This is an easy walk which is quite suitable for families and seniors with public toilets, barbecues, food outlets, parking and other facilities nearby. I have recently spent time in Africa and the link below will allow you to enjoy images and text describing some of my encounters with the wonderful wildlife of Botswana and Zambia. 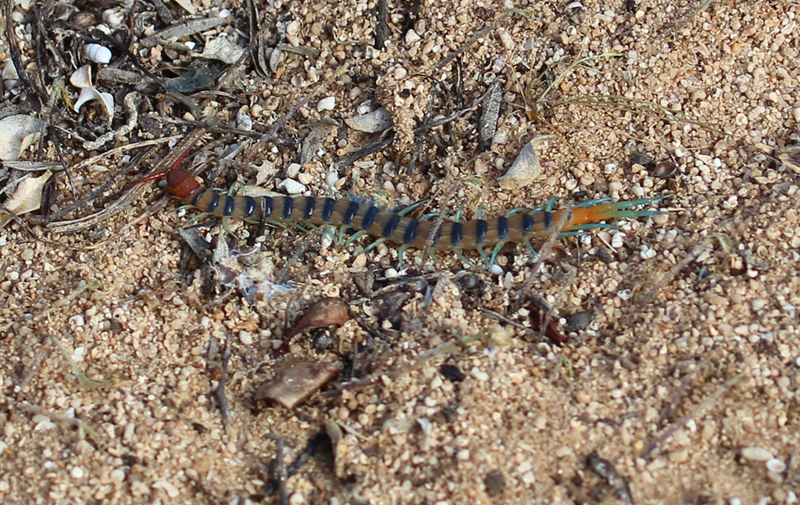 I will attach a new image and notes to accompany each post. The link does not work well on mobile phones and is best followed through a computer or tablet.